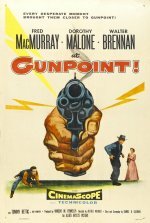 Mysteriously shortened to Gunpoint for its UK release, this is a very average Allied Artists western owing much to High Noon in its plotting. It stars a rather glum Fred MacMurray, but the ever-glamorous Dorothy Malone (seemingly born to play frontiers-women) is the main attraction here, doing sterling work as Fred's wife. Walter Brennan's in there, too, for western authenticity, and the whole movie benefits from being filmed in CinemaScope.